We put our tree up a few days ago. It is amazing how just adding one holiday decor item, such as the classic Christmas tree, can totally put you in the holiday spirit! And also inspire you to create! As I was looking at my tree this morning, I closely examined a few new additions. One of which was this gorgeous beaded beauty that I purchased recently. 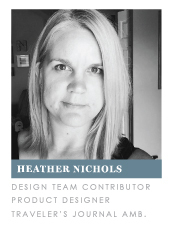 It helped to bring focus to our chosen color scheme these year; green, white & silver! 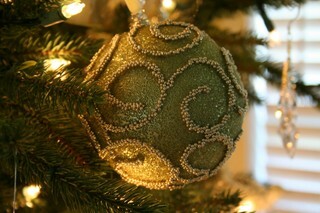 I thought it would be fun to create a Christmas card inspired by this special ornament. 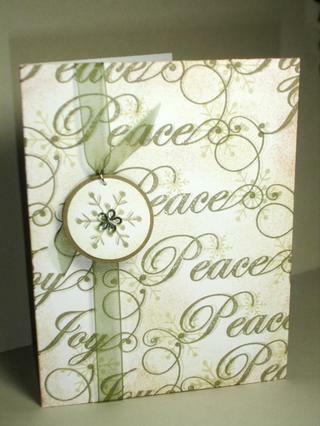 This card is a quick & simple Christmas greeting (gotta love simple during all the hustle & bustle of the holidays!). 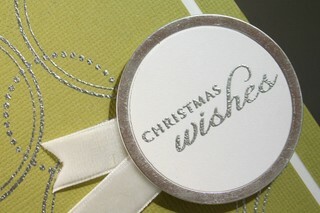 I used my faithful silver detailed embossing powder from SU! along with a silver tag rim to help tie in the shine factor. I have found when embossing with silver powder, the results are much better if used in conjunction with the Encore Metallic Silver ink pad from Tsukineko rather than an ordinary embossing pad. Any area that does not hold the powder thoroughly blends in because of the silver ink showing through! I had fun combining images from Borders & Corners Circle to create some fun background paper!!! Dig out yours and experiment! You can achieve a look that is retro, or more structured and modern! The sentiment is from Believe. I really like the fonts used in this set. A kind of classic elegance is what they emulate, which I think is a style we all try to communicate with our holiday cards! I added a few bits of white velvet ribbon as a finishing touch. 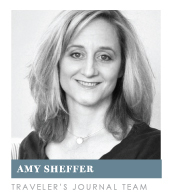 What inspires YOU today? It could be an ornament like me, or perhaps an ad you saw in a magazine today, or maybe even the shirt you chose to wear. Reign in that inspiration and create something beautiful, just for the heck of it! I would love to see what you come up with! I have been on all sides of the stamping world. I remember a time not to long ago, when I was on a very limited budget of $20 per month for supplies. 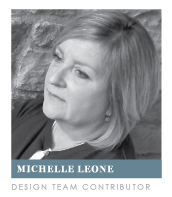 I also know what it is like to have a fairly open-ended budget. 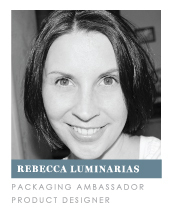 I have had the experience of being involved in direct sales, as I was an SU! demo for a few years. 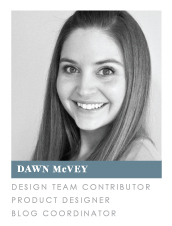 I am now involved with the manufacturing & design of my own products. So I feel that it is accurate to say that I have experienced it all first hand. With that being said, I want to provide you with some food for thought. You are surely looking for innovation when it comes to your purchases, no matter which of the aforementioned categories you may find yourself in. That's one of the aspects of this craft that is so exciting. All of the new products that are constantly introduced, providing you with ongoing possibilities. These innovations are what keep everything fresh and exciting. 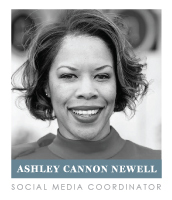 Where would this industry be without a core group of "thinkers" who work hard to continually bring you something new? I would like to think that I could include myself as part of this group, along with a few close friends of mine who are affiliated with their own companies. I know in my particular case, many hours of thought & contemplation go into each set that Papertrey produces. Many characteristics of the images we create are designed with the stamper in mind, making them both user-friendly & trendy at the same time. There are many sets that we currently contain in our collection that I spent as much as 80-90 hours designing, getting everything just perfect and being sure that they were as versatile as possible. I can honestly say that my heart & soul are poured into each and every thing I do. So back to the question at hand... Where would this industry be without a core group of "thinkers" who work hard to continually bring you something new? What is your answer? 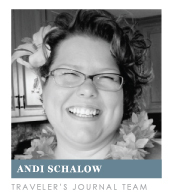 And is your answer reflected in how you choose to spend your crafting dollars? Other companies that take a concept and make it their own virtually get a "free ride". The "thinking" was already done by someone else, so it is easy for them to reproduce the idea within their company and gain profits without any true contributions to the industry as a whole. It is very easy as a consumer to not give a second thought to this philosophy. We want what we want at the lowest price possible. But in the end, what type of company do you want to maintain longevity? The one that puts the time into innovating new concepts continually or the company that likes to take advantage of a free ride? I know that this subject may seem controversial to some, and I am prepared for that. But I think this issue needs to have some attention. I look forward to sharing some stamping related posts within the next few days, but today I really needed o share my thoughts & feelings on this particular subject. Thank-you to all for your support!!! This month's Guest Star Stamper Contest was especially difficult to judge. I got over 450 submissions for Piece of Cake and another 400 for Snowflake Serenade! I ended up sorting the submissions DAILY, just so I could keep up! 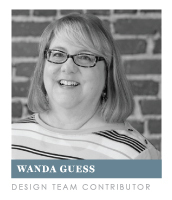 If you haven't seen the winning projects from this month, then you MUST stop by the Ink Pad to take a peek! Lauren Meader did the most amazing project with Piece of Cake. It got a verbal "oohhhhh" from me while I was sorting through all of the competition! I think there are a couple reasons that I loved it so much. The colors are fantastic. Reminds me of a boutique in Paris. And most of all, I loved how well her background tied in with the focal point image. It is such a fantastic use of Beautiful Blooms as a companion set. I love the details of the liquid pearl applied to the centers of each flower on the cake. I love the way she tied a bow with the satin ribbon rather then just knotting it. I just identify with it...with all of it. 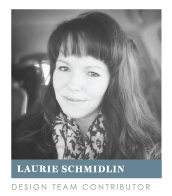 If you haven't seen Lauren's work before, I highly recommend stopping by her blog. 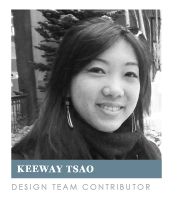 Not only is she super-talented, she also has a big heart. Next up is Jillian Winters. Her Snowflake Serenade project had so many unique attributes compared to others that submitted to the same category. Her use of the acetate was brilliant. The snowflakes seem to be falling gently from the sky. Matting the focal point so it appears to be "floating" really accentuates the snow as well. Her color choices were perfect for the theme of the project too! (Brrrrrrr!!!) The way she incorporated the Nestabilities was really clever as well. The addition of the scallops really adds a special touch. 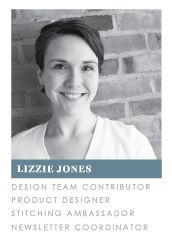 Jillian's taste is classic with a little trendiness thrown in for good measure. 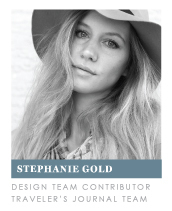 I assure you, if you take a peek at her work on her blog, you will find inspiration surrounds you! As I do every month, there are always several projects that are too fabulous to NOT mention. Here are the official Honorable Mentions from this month's contest! Barb Schram made this beautiful creation with Piece of Cake. She stamped the cake and "glitterfied" it. Then added a layer of acetate over it. She was then able to add the flower accents without any worries about the ink interfering with the texture of the glitter mixing. 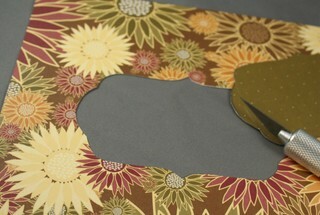 To attach the acetate without any visible adhesive, she used brads and our velvet flowers. I love how the velvet flowers fit right in and add so much detail to the project. Great job, Barb! 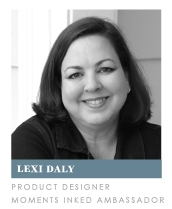 Lexi Daly said that she couldn't wait to "set the table" when she discovered that a scalloped oval punch creates a perfect plate for the slice of cake! I love how she used Faux Ribbon to add the details across the bottom of the card and how they integrate with the sentiment. SOOOOO cute!!! Carolyn King had the most ADORABLE idea! 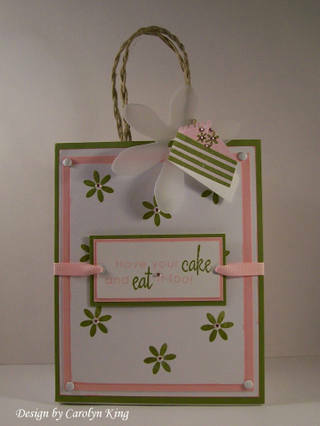 She created a little tag for this gift bag by stamping the slice of cake so the edge was aligned with the fold in a plain white card. 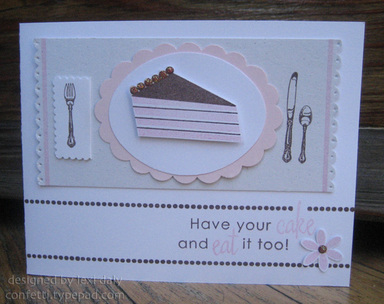 She then trimmed around the cake, creating a super-cute gift card! I just love the way that turned out! She really went the extra mile with the way she embellished the bag as well! 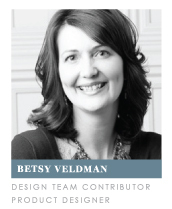 Becky Oehlers went above and beyond with this ensemble she created. She went as far as having an actual cake made to coordinate with the stamp set! 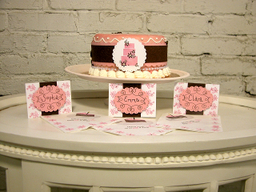 She created a cake band along with matching placecards & napkins! This is one party I would have liked to attend! The napkins are so cute, I don't think I would have had the heart to use them! 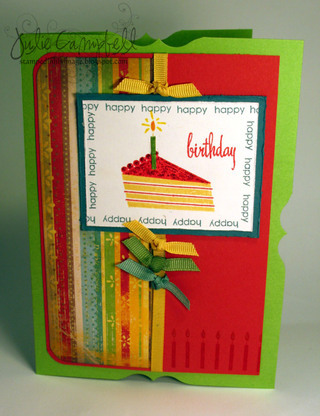 Julie Campbell made this really fun & bright version of a cake card. I thought it was SO kid-friendly, especially as something you could mass-produce and have on hand for all those parties your kids are invited to! I loved the color scheme. 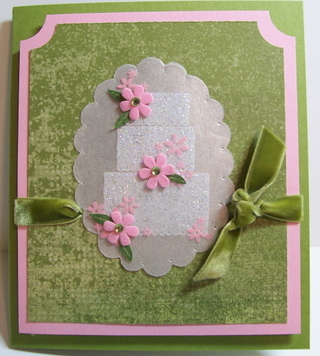 It is so cheerful and happy, which is what we ALL want to communicate with a birthday card! 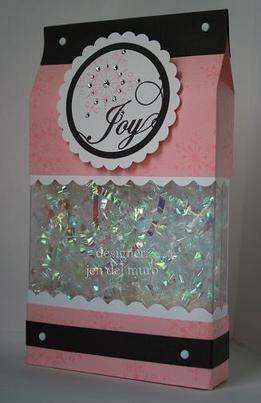 Jen Del Muro did a fun alteration of one of our clear card boxes. I loved the unique color scheme for this wintery project. I also thought that it was a wonderful way to package up all those holiday goodies that everyone makes this time of year. So clever, Jen!!!! Jen also made these cards. 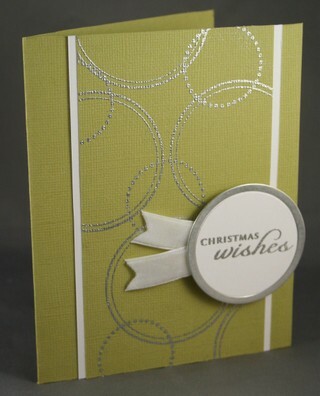 I loved how well the snowflake images coordinated with the Cuttlebug embossing folder. Plus, the projects were nice & clean.....and simple. I think anyone could mass-produce these gorgeous designs in no time flat for their own cards this year. Such an inspiration! Melanie Muenchinger created the most stunning background paper with the words from Snowflake Serenade. I just loved the look of this and thought it was so creative. (I'm quite partial to green as well!) The small rhinestone detail on the snowflake tag is a nice touch as well! All of the details of the contest can be seen here. I look forward to seeing your submissions!!! --->What paper did you use for the monogrammed stationery set? Many of you thought perhaps that this was our paper. I'm afraid I can't take the credit though! It is Harvest Flower from the Harvest Row Collection by Heidi Grace for Fiskars. ---> When will Snowflake Serenade be back in stock? We will be making Snowflake Serenade available to purchase tonight along with the new releases to give everyone a fair shot at the inventory we now have. --->When will you be carrying the Palette reinkers & spots? They did not arrive in time for this release. We are expecting them in about a week or so. --->When will you have the Nestabilities back in stock? We have had a large order in with Spellbinders for a few weeks now and we were just waiting for them to get their inventory back in stock. They should arrive in our warehouse in about a week and a half. --->What exactly is contained in the new Borders & Corners set? Does it have the exact same images that can be found in the original versions? -3 circles that coordinate with the extra jumbo circle scalloped punch. All three borders are replicas of those found in our original Border's & Corners Circle set. -3 squares that coordinate with the super jumbo square scalloped punch. Two of the borders are replicas of those found in our original Borders & corners Square set. One of the borders is the same design, but a new size. 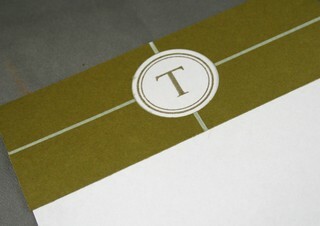 -The set also includes 10 words/phrases that you an use to help integrate the monograms into your projects. If you have been waiting to try Borders & Corners, but didn't know what to start with, this is the opportunity you have been waiting for! This set will retail for $15. 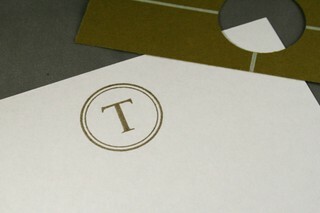 The borders chosen for this set specifically coordinate with the two monogram alphabets that we are releasing as well. 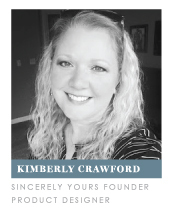 --->Will you be selling an add-on set that features JUST the words & new size square border, for those of us that already own the original Borders & Corners? Yes, but not in conjunction with this release. We are hoping to have these mini sets available for our next release in December. --->How many Plain Jane Cigar Boxes do you have in stock? Not enough! When we ordered these a few weeks ago from Cosmo Cricket, we cleaned them out of their entire stock. We are currently working with them to get more, and if all goes well it will still be about 8-10 weeks before we are able to get additional stock. SOOOO, what we have available for the release tonight is all we will have in preparation for the holidays around the corner. Perhaps you can think of these as Limited Edition! --->When & where is the release party tonight? Our official release party will be taking place at our Splitcoastampers Member Company forum. The festivities begin at 10pm EST. You can read THIS post about the exciting contest we will be holding! Today is the day! Tonight at 12am EST, all of the stamp sets that I have been dangling in front of you will be available for purchase! And don't forget our release party at 10pm EST on our SCS forum. It is going to be a WILD night with an amazing contest too! Be sure to stop by and say hi! So, are you ready for the final sneak peek? It is the grand finale, for sure! So pull up your comfy chair and your favorite beverage (whether it be hot or cold) and settle in for a good read! I have saved the best for last! Let me introduce you to Plain Jane. Plain Jane Cigar Box that is, from Cosmo Cricket, retailing for $6! 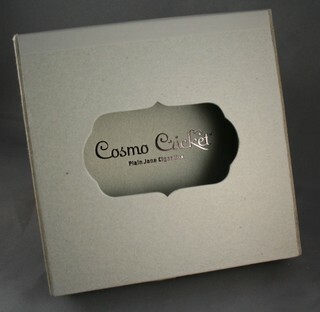 You will love the possibilities that this box holds inside & out. 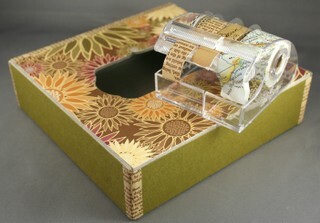 Constructed of sturdy 1/8-inch chipboard, this box can be easily covered with your favorite designer papers or cardstock. 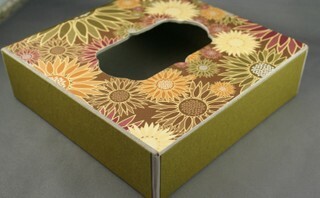 If altering isn't your thing, painting the box or stamping directly on it's surface is also an option. 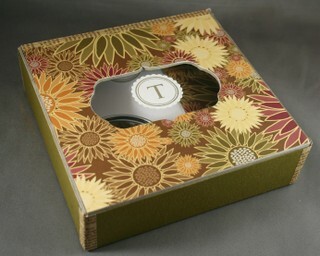 The unique die-cut window in the lid really allows this box to stand-out in a crowd. It is also perfect for containing our exclusive Stationery Kit. 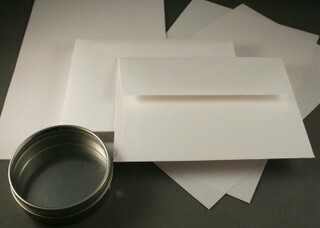 The stationery sheets are made from high-quality paper, similar to that found is fine stationery boutiques. 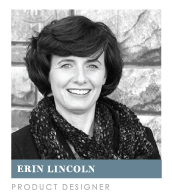 It is easy to customize them by adding small images or monogramming to the top of each sheet. This paper takes ink beautifully! I decided to do monograms on my set. To make it easy to stamp the sheets with perfection each time, I created myself a template. I cut a piece of cardstock 5.5 x 1 inch. I drew gridlines through both centers and then punched a 1-3/8 inch circle from the exact center. 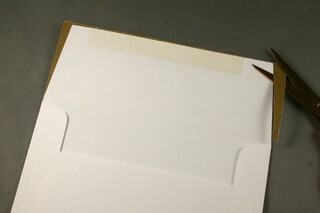 I was then able to lay the template over the top of my stationery sheet and stamp through the opening. It was very easy to place the template on each sheet as I went through stamping them all. I decided to carry over my patterned paper into the sheets by adding a 3/4-inch strip at the bottom. If you stuck to those dimensions you could add this detail to every one of the 30 stationery sheets with one 12x12 patterned sheet of patterned paper. 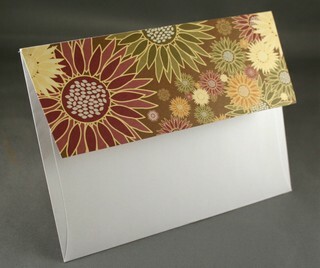 The envelopes feature an elegant square flap that shows you have chosen nothing but the best. (It is industry standard to include twice as many stationery sheets as envelopes, to allow for two-page letters and errors by the writer.) I decide to customize the envelopes too. I cut pieces of the paper about the size of the flap. I then adhered the patterned paper strips on and trimmed the edges from the back. It allowed me to see a little better as to what I was doing. Here is a finished envelope! Super easy with stunning results! While I was playing around I came up with the cutest idea EVER. I lined the tin that is included with this kit, using the same patterned paper that I used throughout. All I did was cut a strip of paper to adhere to the inside side and I cut a 2.75-inch circle to adhere to the inside bottom. Think of how many ways you can use that concept. I can hardly wait to use it in further applications! 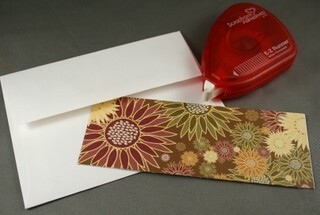 The adhesive paper sheets are perfect for creating your own envelope seals. 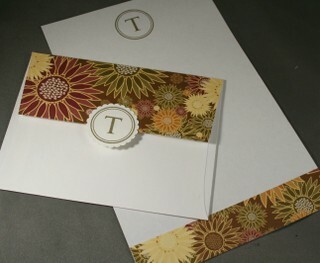 Stamp your chosen monogram or image onto the label paper. Then punch them out with a coordinating scalloped punch. 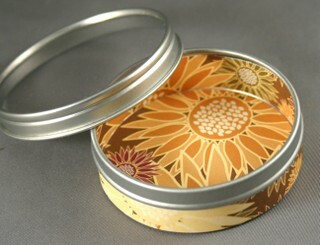 The small tin, described above, will contain the seals you create with style! The recipient will be able to just peel the backing from each label and adhere them in place on their envelopes! Now that you have all this beautiful stuff, you need a place to gather all of it together. Here's where Plain Jane comes back into play! First cut a piece of patterned paper 6-1/8 x 7 inches. Temporarily adhere in place so that there is some extra overhang over the back. Flip the box over so that the patterned paper is face down on your table top. Trace the opening of the lid with pencil. 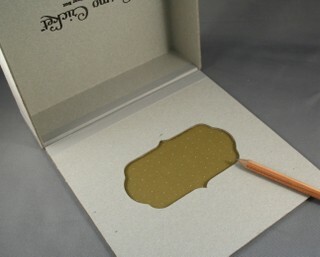 Next, you want remove the paper from the lid and cut along the pencil lines with a craft knife. Finally, adhere the paper back in place on lid, applying extra adhesive on the very back so that you are able to fold the overhang over and down the back of the box. 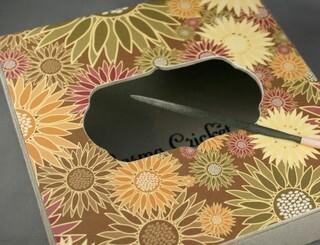 Use sanding tools in a downward motion around the inside edge of the window to form fit the paper to the box. 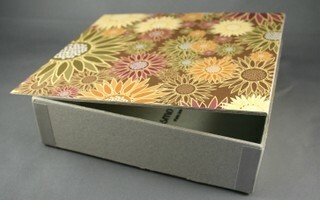 For the sides, cut four 6 x 1-5/8 inch strips of cardstock or paper. Adhere them in the center of each side. They will not go all the way to the corner, we will be covering those in the next step. You will need to sand the cardstock on the front slightly since it is a tad lower then the remaining sides, due to the gap allowed for the closing of the lid. 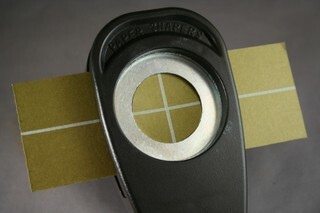 Cut pieces of binding tape to cover all four corners and reinforce the hinge at the back of the lid. (Mine is from Heidi Swapp). As the finishing touch, I adhered clear transparency to the back of the opening in the lid and attached a scalloped monogram which appears to "float" in the window. 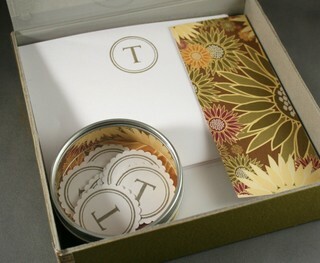 Here is a little peek of one of the many ways you could arrange the inside of your box with all the contents. I just love this project because there are SO many different looks and styles you could achieve with such a customizable basis, such as the cigar box & Stationery Kit. I am really excited to see what you come up with to! 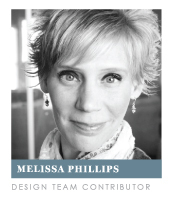 I look forward to seeing many of you tonight at the release party! Thanks for stopping by!